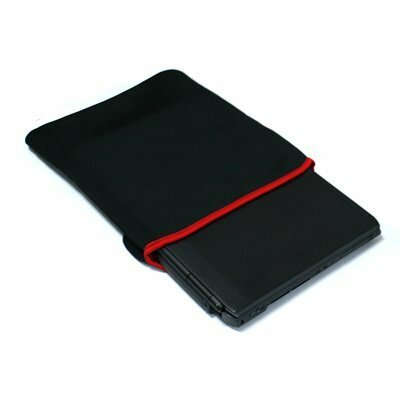 Protect your Laptop/Notebook with this durable and elegant neoprene case! Form-fitting neoprene material stretches to accommodate most laptop/notebook up to a 17 inch display. Durable neoprene cushion and protect your computer. Protect your laptop/notebook from dust, scratches, fingerprint, wear and tear from traveling. Designed for easy removal and insertion. Dimensions(L X W X H): Approx. 15.25 x 12.0 x 0.25 inch. Brand new generic case. Easy-to-clean neoprene. I was hesitant about this sleeve since there was nothing to secure the laptop from slipping. Just a flap at one end. Well ther is a reason there are no plastic clips, velcro straps etc. These would scratch the laptop. I ordered 2 , one for myself and one for my daughter. We both love this sleeve. It is just the right size and the flap secures the laptop inside. There is a bit of a rubber smell but I think it will leave in time. Worth the money. The product is soft yet thick enough to help protect it. However it is a soft sleeve not to be confused with hard sided bags. This sleeve, although a good product and it seems decent quality, does not fit the hp dv7 series of 17.3 inch laptops. So I bought a generic sleeve designed specifically for the 17.3 inch laptop at office depot. That one fits perfectly. I like this product! For some reason when it arrived it smelled like petroleum, but I aired it out a bit, and we're good to go. Fits like a glove on my 17" Toshiba. The price was right as well. Similar ones that I saw locally were $25.